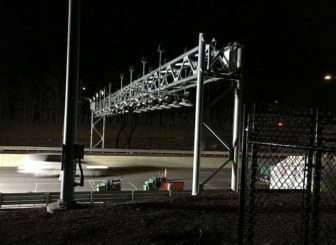 The legislature’s Transportation Committee narrowly passed a bill Thursday that could establish tolls on Connecticut highways — but the measure’s ultimate fate remained uncertain. Advocates of the bill conceded opposition to tolls remains strong in the full House and Senate and that some legislators on the fence could be reluctant to back tolls in a state election year. House Speaker Joe Aresimowicz, D-Berlin, has said the chamber will vote this year on a measure to establish tolls. “We’ll have a (House) vote on it, and we’ll have to see,” Rep. Tony Guerrera, D-Rocky Hill, the House chair of the Transportation Committee said, declining to predict whether it would pass there, or in the Senate. The legislature is narrowly divided in both chambers. Democrats hold an 80-71 edge in House while the Senate is split 18-18. The Democrat-controlled Transportation Committee passed the bill in a 19-16 vote along party lines. Guerrera, one of the legislature’s most ardent supporters of tolls to finance a major rebuilding of the transportation infrastructure, said the measure could end a lot of confusion. The bill also would allow the legislature 30 days to act upon the report after receiving it during the 2019 General Assembly session. But if the House and Senate did not reject the DOT’s plan, the restoration of tolling would be deemed approved. 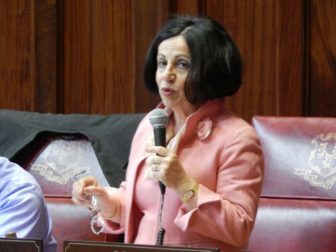 Rep. Gail Lavielle, R-Wilton, another opponent of tolls, called the measure unnecessary, adding that the DOT could study tolls without a legislative mandate. Lavielle said the public would immediately assume adoption of this bill would ensure the establishment of tolls — even with the 30-day window for lawmakers to reject any DOT plan. “I do not want to mislead people,” she said. Sen. Toni Boucher of Wilton, Senate GOP chair of transportation, argued Connecticut’s economy simply can’t bear tolls right now. But Rep. Jonathan Steinberg, D-Westport, said Connecticut’s aging, crowded transportation infrastructure is hindering economic growth, and that won’t change unless the state finances a major rebuilding of infrastructure. “I submit we have our heads in the sand,” he said. Steinberg and Sen. Cathy Osten, D-Sprague, also warned lawmakers not to underestimate the repairs Connecticut’s roads and bridges need. Osten also noted the retail gasoline tax has been set at 25 cents per gallon since 1997. “If people think a quarter today is the same thing it was in 1997, they ought to look in their pocket,” she said. 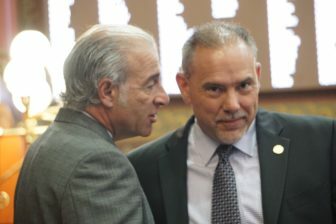 Rep. Tony Guerrera, left, talking to House Speaker Joe Aresimowicz about his tolls bill, which never came to a vote. Absent more funding, the state would need to scrap some rail services, drive up fares, suspend 40 percent of planned capital projects, including major highway projects such as rebuilding the Hartford viaduct, to remain solvent over the next five years, the administration says. The governor asked legislators in February to add seven cents to Connecticut’s 25-cents-per-gallon retail gasoline tax, and to order electronic tolling on highways. The latter, if approved, probably would not yield major revenue until the 2021-22 fiscal year, the administration says. The bill approved in committee Thursday also includes a provision to bolster the Special Transportation Fund in the short-term. The legislature already has approved a plan to gradually transfer sales tax receipts from new car purchases from the budget’s general fund and into the transportation fund between now and 2021. This would accelerate that plan, adding an extra $9 million to transportation this fiscal year and an extra $67 million in 2018-19.